I’ve also been thinking around adding more structure around conversations. 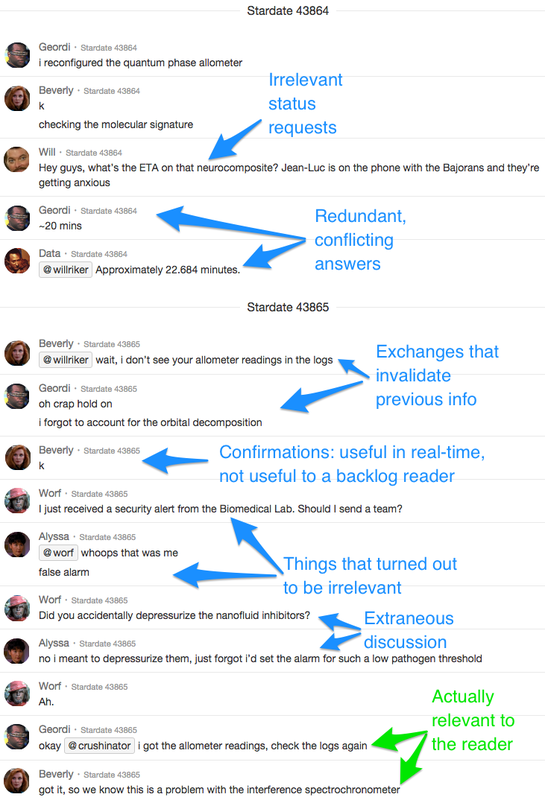 Troubleshooting sessions can be quite chaotic and the singular, linear dimension of a conversation (chat or otherwise) puts a big damper on the effectiveness of working together. I think the same holds true for team meetings where during conversations you often come up with things that should be addressed, extra questions etc, but the conversation can rarely support evolving in more than 1 way at the same time. So i had been thinking about a “2nd stream” (next to the actual conversation/meeting) which could be a chat room in which people could add notes like ” question”, ” ” etc. Part of the use here is that you can get them out of your head so you can focus on the conversation at hand, but also the ability to make sure all points eventually do get addressed, and i feel like it would also helps in optimizing the time of the people involved. some topics only require a subset of people to participate etc, and it’s always nice to be able to organize a meeting to optimize for that, even if the topics of the meeting change while it’s being held. anyway, this may seem like a different topic but I think the problems are quite similar and perhaps a solution can be built that addresses both. Any particular reason why you think a kanban board would be a good fit? The usual benefits of a kanbard don’t seem to apply (progression through columns, WIP limits, etc) so it seems like you’re chosing to use it as a generic way to organize things into a few categories, unless i’m missing something? I had been thinking of just a command line tool / custom little web app or something. You’re right: the reason I jumped to Trello was because it already exists. It’s a way of organizing pieces of information into groups, and it lets you do the most important things for my use case: label things as no-longer-active, attach images to things, and provide an API. I needed something a little more structured and automatable than, say, a Google Doc. But for the case of managing tangents in a meeting, I use Google Docs and I find the solution pretty compelling. It takes a little more effort to parse, but it’s also more flexible and user-friendly than any DIY tool I could write. Thank you for this post. Definitely can commiserate with the chatOps/fog of war/getting up to speed chaos in the heat of the moment thing. I read your earlier post here https://danslimmon.wordpress.com/2012/07/20/you-know-whos-smart-friggin-doctors-man/. When you were diagnosing the donations dip issue you mentioned “we” offhand how do you know who “we” are? As this post states diversity of opinion at the outset will give the best outcome for this differential diagnosis method you’ve described. Are there concrete examples of a devOps way of getting core stakeholders at the beginning of this differential exercise? Also it’s really interesting that you looked toward the domain of medicine to find problem solving methods in a communal setting when devOps also can trace it’s origins back to lean manufacturing e.g Toyota car manufacturing. Great question about diversity of opinions. I don’t have a formal answer for it, nor can I cite one from the medical literature. So I looked at social science literature on brainstorming, and I’m still can’t find much research on the effect of role diversity. which argues that, in translating one team’s ideas to the parlance of a different team, we force ourselves to refine our own understanding and gather stronger evidence. All of which improves our results. So, to your question: I try to involve people from all parts of the service chain in the hope that together we’ll have a holistic model of the problem, all the way from customer to server. As long as you’re trying to draw on the strengths of every part of the team, you’ll pick roughly the right set of people. For the “dip” issue, I believe we had 2 ops people, a coder, an account manager, and the VP of technology in the room. Leila Johannessen’s PhD work showed clearly the need to invest in establishing & maintaining common ground as a prerequisite for future problem solving. She observed experts investing time and attention in tracking a process and in tracking another cognitive agent’s understanding of that process in order to be able to solve new problems quickly. The process was too complex to allow an expert to be called in after the problem was engaged — the time and effort needed to get up to speed in order to begin work on solving the problem was too much and too long for the expertise to be of use. In all likelihood what you are calling common ground is only one part of the Common Ground that is required to solve devops problems. Sustaining common ground depends on the individuals staying abreast of the situation — both of the process and the understanding that others have about that process — and this requires substantial effort. It is one reason that true outsiders rarely contribute much to cutting-edge problem solving in devops. One might think of the expertise that can be brought to bear as a penumbra: not directly involved but aware of what is going on and (quickly) recruitable and (quickly) up to speed. There are studies showing how groups accomplish this, some in highly demanding and complex settings. NASA’s Mission Control uses voice loops, described by Emily Patterson and Jennifer Watts. These are audio channels dedicated to specific roles or functions but available for monitoring by the larger group. Interesting in their study is the fact that (1) very few people speak on these channels and those that do speak briefly so that the channels are largely quiet and (2) people monitor multiple channels simultaneously with ease while they work. People choose which channels to monitor depending on their roles and the mission conditions. It is clear that the monitoring adds some small cognitive load but that this listening in pays back dividends. 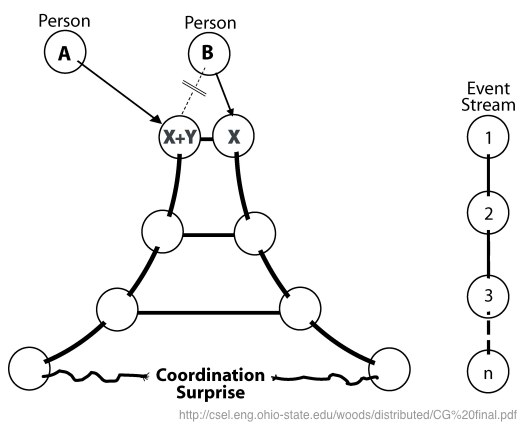 Perhaps most notable of the dividends is the relative paucity of direct comm coordination overhead required and the ease and especially the smoothness with the network of actors can be engaged in problem solving. Although this is surely a unique, mature situation where the network of actors and the supporting comm have been tailored over many years, it provides a good example of what can be accomplished. The Mission Control setting is particularly powerful because there is a great deal of shared information projected to all the actors. We are mostly lacking this in devops, although the dashboards and other monitoring information available goes some way to support the same sort of common awareness. Because the kinds of problems that occur in internet operational settings are so varied it’s probably not possible to create a priori a single display that can support Common Ground or even common ground ;-> I know that Mark Imbriaco’s group is seeking to build tools that can support common information displays in order to promote common grounding. This is a challenging area and likely to see significant change over the next 2 years.